I’ve known about Vyatta for a while, but whilst the premise has always seemed appealing I’ve not had a reason to dig deeper. Vyatta propose to be ‘The open source alternative to Cisco’, which appeals as a nice fit into a low-cost training and development lab so tonight I decided to take a closer look. I started by downloading Vyatta’s prebuilt VMware image, which can be downloaded here along with a Xen image and an ISO file for physical install. The VMware image is designed for workstation applications, but a quick run through my new friend in VMware Converter I quickly had the image transfered across to my ESXi based environment and booting without issue. Configuring different parts of the system are similarly simple, and with a bit of experience theVyatta systems seems intuitive enough and from basic testing performance is more that adequate, at least for my requirements. The time I’ve spent getting to grips with a new system has paid of so far, and for the time being I have a nice new addition to my lab environment. I’m hoping this system can provide some seperation between between between target/test systems and provide additional realism t my lab. For anyone that has had to migrate machines to a virtual environment VMware’s Converter will likely be nothing new. It allows a straight forward way to migrate an existing server (both physical and most common virtual environments) to VMware’s Infrastracture, Server or Workstation product suites. Whilst this is hugely useful in a real-world environment for p2v or v2v migration strategies it doesn’t have too much use in a lab environment as you would typically build your environment and servers once and then test away. But I’ve recently found another use, with a few simple clicks I can now easily transfer a virtual server/servers from my ESXi lab environment to my laptop to continue working away from the office, and without the need for maintaining parallel victim machines within each of my virtual environments. The transfer process does take some time, image below shows the start of the transfer of a 20GB machine from my laptop to ESXi server of local 100Mbps network. However don’t be too put off initially, original estimated run time is nearly four hours, when in actuality it completed in a little over one. Good for fire and forget transfers whilst you make dinner. Some people I’ve discussed the tool with have anecdotal stories of having issues and failures with VMware Converter, I haven’t encountered any problems with my usage but your mileage may vary depending on scenario. At the very least is should be simpler than my previous method utilising DD. I was recently asked by Don over at EH-Net if I would be interested in reviewing a new book by Thomas Wilhelm of Heorot.net: ‘Professional Penetration Testing: Creating and operating a formal hacking lab’. Naturally I jumped at the opportunity. I don’t want to discuss the book in too much detail here, as you can read the full review at Ethical Hacker here, but the book is a great addition to my home library. Don also worked his magic to convince the publisher to release a chapter from the book free of charge, chapter four covers the initial setup and configuration of hack lab environment, and can be downloaded from the review. Hope the review is of use to someone out there, thanks to Thomas for writing the book in the first place and to Don for hooking me up with the review. As part of an upcoming project I’ve been playing with some screen capture and editing software. As I’ve never been one for for the graphical/fluffy side of IT it’s a new area for me, and I was shocked with how simple it can be. For screen capture I used the free CamStudio application, at first try it seems small, lightweight and most importantly simple and intuitive to use. Finding decent editing software for free was difficult, @usedtire suggested Cinelerra for Linux. From the site it looks to be an impressive application, but I’ll admit I found no easy way to get this running under Debian/Ubuntu and ended up in dependency hell, so I installed Windows Movie Maker thanks to the links/instructions I found here. Very grateful to Timmedin for pointing me in the direction of his recent work with the same issue. In usual form, Tim has even packaged up a powershell script to automate the workaround. Check his fix here, much cleaner and slicker than my own. If your still curious, read on for the backstory. Since rebuilding part of my toolkit I’ve had issues connecting to my ESXi host server. I had originally thought this was a result of an upgrade from ESXi 3.5 to ESXi 4.0, and the resultant change from VMWare infrastructure client to the new vSphere client. After several hours and days fighting down a blind alley I found a forum post that highlighted Windows 7 as the culprit. Further reading indicated that this is a widespread issue with no real solution. Best workaround appears to be to run the client within a sandbox via Microsoft’s Virtual XP environment for Windows 7. After a couple of false starts the install process was fairly straightforward, found here. Simply select hardware architecture (32/64-bit), install a patch, then finally the Virtual XP image. Everything beyond this works as expected, a virtual XP machine. 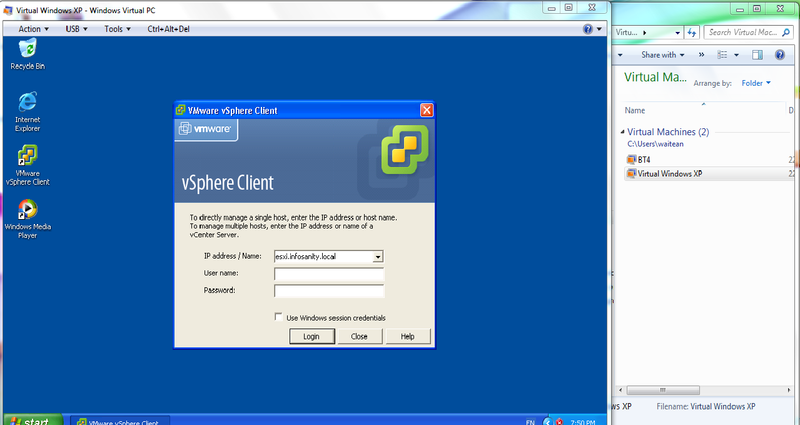 Once in the virtual environment install the vSphere client as normal to regain access your VMWare environment. Knowing my preferences, observant readers may be wondering why not achieve the same results using a VMWare guest with the vSphere client installed. VMWare Server is already installed on my machine, and was one of my initial thoughts. However, Virtual XP and VMWare utilise virtualisation for different results. The Virtual XP client has several intergration features (can be disabled if prefered) that allow simple, native access of resources on the host machine (files, directories, peripherals etc) from within the guest. This makes working with either, and between, host and guess seamless. Obviously such intergration would be unsuitable for a lab environment as you want/need isolation, seperation and protection from the guest machines so VMWare still has it’s place. As usual, using the right tool for the right job is essential. At this point I’m back in my lab, and the R&D rolls on, but the experience has led me to look more indepth and Virtual PC. I have started building a BackTrack4 guest with Virtual PC to run within my standard machine for everyday use. Having access to a Linux environment as simply as a double-click as per normal applications will hopefully be a nice addition to my usual working practice.